Dinner: Tina and I attended a vegetarian Indian cooking class taught by Chaya Rao in her lovely home. Chaya used to be an IT instructor before changing careers and now teaches Indian Cooking (she's been an instructor at Whole Foods and Central Market in the past) as well as running Vegicurean. I was photographing most of the time and didn't write anything down (Chaya will email the recipes to us later) so hopefully, I'll correctly identify what I ate. (If anyone else who was at the class reads this and can put in there two cents, I'd appreciate it!) 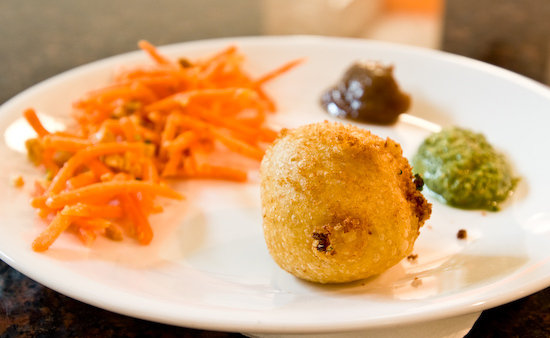 Chaya started off the dinner by showing us how to make these deep fried potato appetizers. 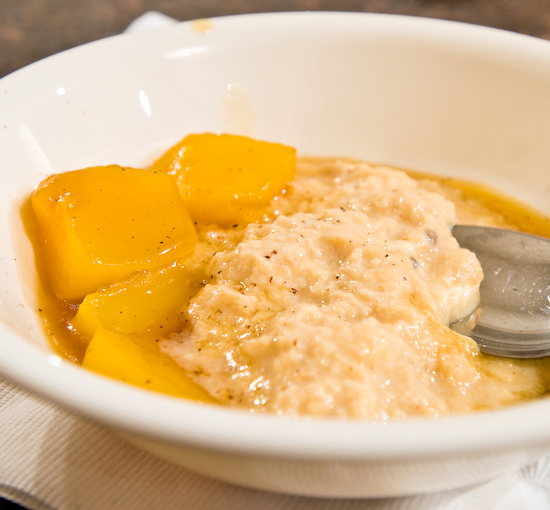 Seasoned Yukon Gold potatoes were riced, seasoned, rolled into balls, then dipped into a batter of chickpea flour, rice flour, salt, and baking powder before being fried. They were soft and fluffy and incredibly flavorful. She served them with a simple (but incredibly flavored) carrot salad and two chutneys she prepared beforehand. 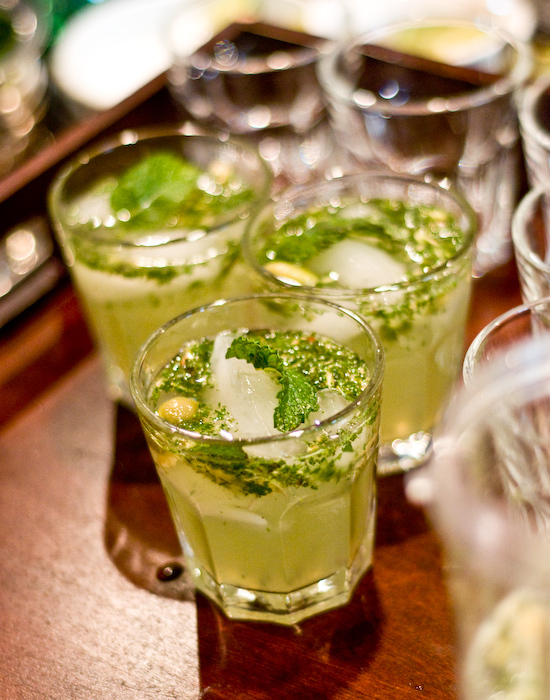 Chaya then showed us how she makes a cardamom mojito. Next up was a dal of two types of lentils which she prepared in a pressure cooker with spices, garlic toasted in ghee, and tomatoes. After pureeing the cooked lentils and adding some water to bring the soup to the desired consistency, it was served to us with fresh lime juice and cilantro (added at the end to preserve the flavor and not add any bitterness as they cook). 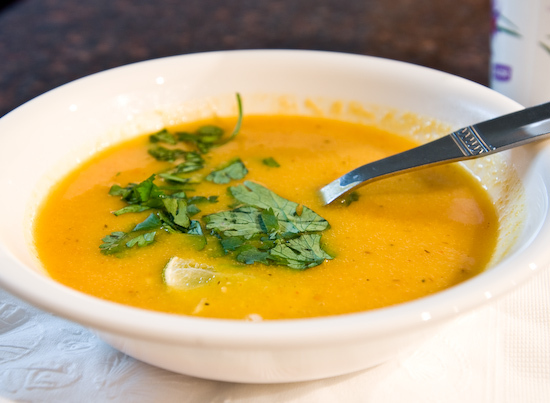 I could have had an entire meal of the dal (and maybe a piece of rib-eye steak, but still, I considered adding the dal to my mental steak dinner which says a lot since I'm not usually a soup person). 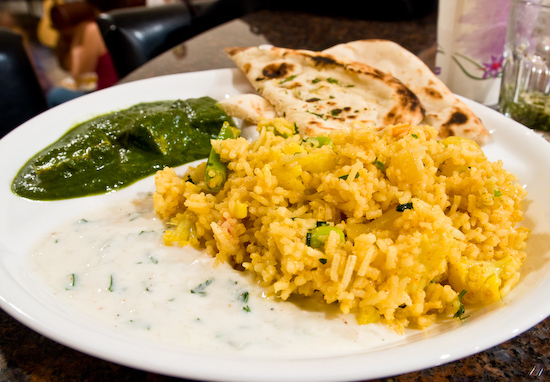 The main dinner would be biriyani and saag paneer. I was really excited about both since I love ordering both at Indian restaurants back when I lived in California (just a little over two months ago). Now that I think about it, I don't think I've had either one in almost a year. 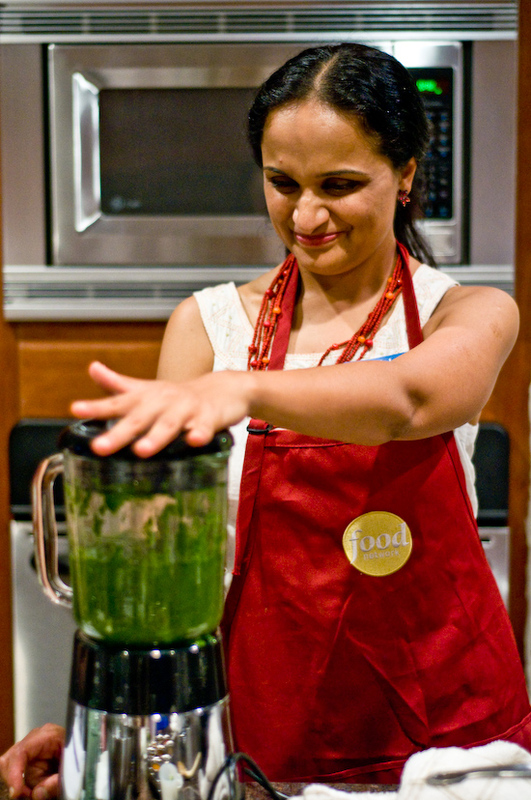 Her saag paneer was made with fresh spinach and looked (and smelled) amazing. The colors were so vibrant (much brighter green than what I'm used to) because she doesn't use frozen spinach. 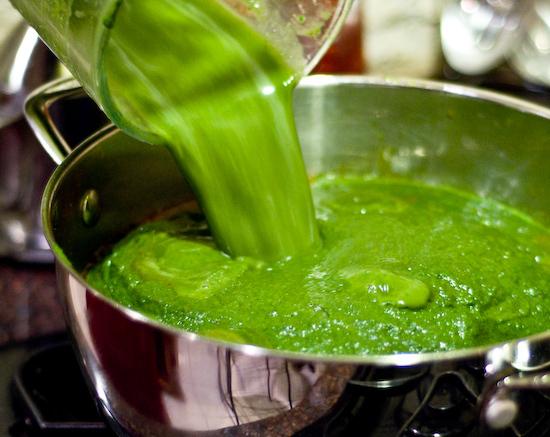 She also purees the saag - a step she says restaurants often skip when they use frozen spinach because the spinach is quite chopped up already before freezing. The vegetable biriyani was also excellent with tomatoes and cauliflower accented by many spices bringing the plain basmati rice to a new level of awesomeness. I can't wait until Tina tries these dishes at home. Dessert was both sweet and salty. I'm not sure what was in it - some dairy (milk curds?) with mango slices? Brunch: I fried up a pasture-raised chicken egg (none of that so-called free-range chicken egg business this morning - these guys don't just have the option to wander into the outside, they are outside… in real grass… with insects… and worms. You know, how chickens are supposed to be) from Coyote Creek Farm in Elgin, Texas (which is about the same distance from Austin as we currently live - now that's local!). At around 50 cents per egg, I'm not sure I'm ready to take the plunge and buy these as my regular eggs. The egg was incredibly tasty which prompted us to fry up more eggs - this time our current egg staple: Eggland's Best (which we buy at around $3 per dozen). Eggland's Best is a really good tasting egg - we feel that in comparison, "normal" supermarket eggs taste kind of flat. In today's, taste test - Coyote Creek Farm edges out Eggland's Best in taste. I'm going to have to do a few more comparison and cook the eggs in a couple different preparations before coming down with a conclusion as to which egg tastes better. I don't know how Eggland raises their chickens, but I can only assume they are in confined spaces (because Eggland sells a cage-free variety that is almost as expensive as Coyote Creek Farm's eggs). Even Eggland's cage-free eggs are probably raised in the same way most free-range egg raising operations are - the chickens are given access to barren outdoor enclosures to stretch their legs if they choose to (which most don't - it's a convenient lie to make us feel better about how we raise these birds). It really looks like Coyote Creek Farm's birds roam outdoors and eat grass, bugs, and food that nature intended (as well as feed). (See these photos). In that sense, an extra couple dollars for excellent tasting eggs may be worth the cost to promote humane and sustainable methods of raising chicken eggs. I'm pretty sure I'll speak about this some more in the future. 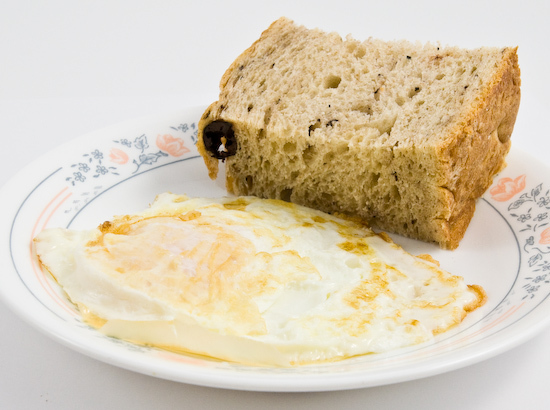 The bread we had with the eggs is an olive loaf. What were some of the qualities of the egg? Extra salty? Although I spend a lot of time writing about food, I'm not very good describing base flavors and to me egg is one of those. The yolk tastes extra eggy (you know when you have a custard and you can taste the difference if they use really fresh eggs? it's that taste) and the whites have no off flavor. Sometimes the whites give off a detectable smell that I dislike that I describe as an off flavor. This isn't there in either of the eggs.